POTSDAM - Two young women from Indian River Central School were the lucky winners in a raffle to receive music lessons from members of the Orchestra of Northern New York, the North Country's only year-round professsional symphony orchestra. Kierstyn Waugh, a cellist, and Jade Tichko, a percussionist, are in the 8th Grade at Indian River Central School. Both have been studying their instruments for three years. They entered the raffle last fall when a group of 60 students from Indian River School attended an ONNY concert in Watertown. Kierstyn, the daughter of Carriann Church, is in the choir, a member of the school orchestra, and active in sports, including softball and soccer. She says she likes the cello because of "the deep sounds that are really rich, and not high like the violin." She received her lesson from Dr. Robert Docker, ONNY cellist and member of the Crane School of Music faculty. Jade, the daughter of Mike and Tammy Tichko, is active in school clubs, band, chorus and sports, including lacrosse, soccer and basketball. She enjoys percussion because of "how diverse it is, playing different instruments." 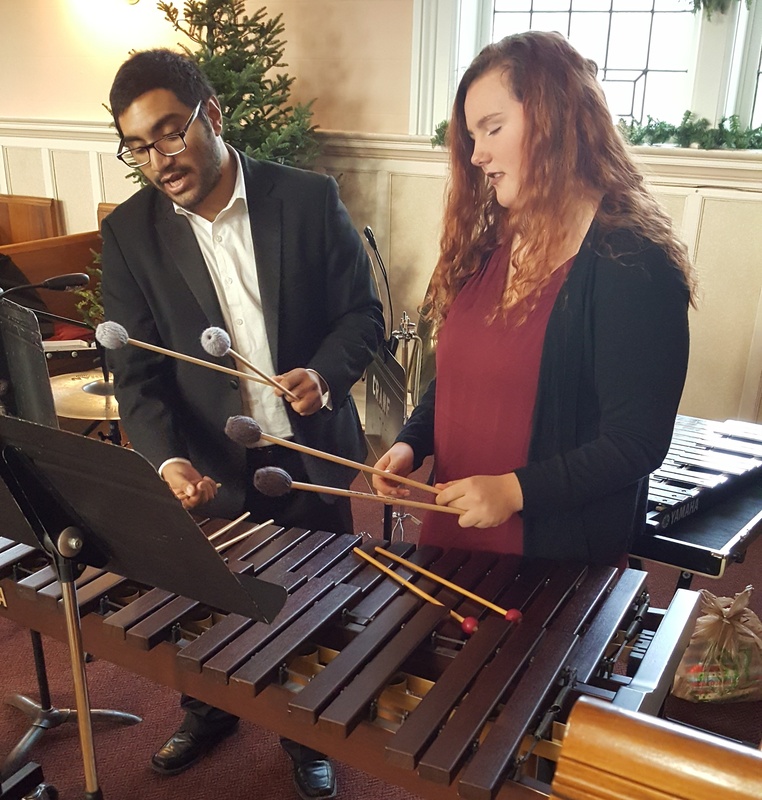 She received her lesson from Aaron Andia, a percussionist with the Crane School of Music and one of the few Crane students selected to play with ONNY. Part of ONNY's mission is to engage young people in the appreciation of music. Its youth programs include hiring student apprentices from the Crane School of Music to play with the professional orchestra; hosting an instrumental music competition for high school students each year; and offering free admission to students, 17 and younger, to all ONNY concerts. POTSDAM - The public is invited to bring a vet to the Orchestra of Northern New York's summer pops concert to be recognized by the audience for their service and sacrifice to our country. Each year, the Orchestra asks those in attendance who are veterans or active duty military personnel to stand and receive the thanks of those in attendance. This year, the 62-piece Orchestra, under the direction of Maestro Kenneth Andrews, will host two performances of American Pops and Summer Jazz at 8 pm, Monday, July 3 in Watertown's Thompson Park and 7 pm, Tuesday, July 4 in SUNY Potsdam’s Hosmer Hall. The program opens with O' Canada and the Star Spangled Banner, followed by the Armed Forces Salute and American Patrol as the Orchestra's salute to military personnel. A medley of Duke Ellington music precedes Deep Fascinating Things that features the music of Jerome Kern, Irving Berlin and George Gershwin. The second half of the program begins with A Salute to the Big Bands, followed by Sincerely Sinatra! - a world premiere arrangement by noted jazz trombonist and arranger Bret Zvacek. He is Professor of Music and Director of Jazz Studies at the Crane School of Music as well as a clinician and performing artist for the Yamaha Corporation of America. He is also a charter member of ONNY. The program concludes with the 1812 Overture and The Stars and Stripes Forever. The July 3rd performance in Watertown's Thompson Park is free. Festivities begin at 5 pm with the Double Barrel Blues Band, continue at 7:30 pm with welcome speeches and at 8 pm with the ONNY concert. Fireworks immediately follow the concert. Tickets for the July 4th Potsdam performance are $22 adults, $18 senior citizens and military, free for children (6-17) and $5 for college students with I.D. The program begins at 7 pm so it will end in time to enjoy fireworks offered in the region. Coupons for $5 off each ticket can be found in local and regional newspapers this week. The Orchestra of Northern New York, celebrating its 29th year, is the North Country’s only professional year-round symphony orchestra. It is funded, in part, by the Northern New York Community Foundation and the New York State Council on the Arts, a state agency with the support of Governor Andrew Cuomo and the NYS Legislature. POTSDAM - Some of Mozart's most beautiful arias will be sung by Jonathan Stinson, baritone, and Samantha Stinson, soprano, when the Orchestra of Northern New York performs its spring concert. Mostly Mozart will be presented for two performances only: 7:30 p.m., Saturday, April 22 at Hosmer Hall, SUNY Potsdam and 3:00 p.m., Sunday, April 23 at First Presbyterian Church, Watertown. Samantha Stinson is heralded as a soprano with a "rounded, commanding top" (Chicago Broadway World). Recent operatic engagements include Mabel in Pirates of Penzance, Adele in Die Fledermaus, Yum-Yum in The Mikado, Musetta in La bohème, Mme. Goldentrill in The Impresario, and Susanna in Le nozze di Figaro. Equally comfortable on the musical theatre stage, she has appeared as Franca in The Light in the Piazza and Lily in The Secret Garden. Dr. Stinson's concert solo work includes Handel’s Messiah, Mozart's Requiem, Vivaldi’s Gloria, Bach's Weinachts Oratorium, and Beethoven’s “Choral Fantasie” and Symphony No. 9. She was most recently seen on Potsdam’s CPS series as Cinderella’s Mother in Into the Woods and Miss Andrew in Mary Poppins. Dr. Stinson holds a Bachelor of Music degree from the SUNY Purchase Conservatory of Music, a Master of Music degree from the Chicago College of the Performing Arts at Roosevelt University, and the Doctor of Musical Arts degree in Voice Performance from the University of Cincinnati, College-Conservatory of Music. She has previously taught on the faculties of Northern Kentucky University and the Crane School of Music at SUNY Potsdam, and is currently an Adjunct Professor of Voice at St. Lawrencee University and a voice instructor at Crane Youth Music Camp. Jonathan Stinson, baritone, has appeared with opera companies throughout the country, including Cincinnati Opera, Lyric Opera of Kansas City, Kentucky Opera, Opera Omaha, Opera Memphis, Dayton Opera, Cleveland Opera, Central City Opera, Ohio Light Opera, and Opera New Jersey. Recent favorite roles include both Marcello and Schaunard in La bohème, Conte Almaviva in Le nozze di Figaro, Guglielmo in Così fan tutte, Sid in Albert Herring, Joseph de Rocher in Dead Man Walking, and the title roles of Gianni Schicchi, Eugene Onegin, and Don Giovanni. Recent solo work has included the Requiems of Faure, Mozart, and Duruflé, the complete Bach Weinachts Oratorium, and Berlioz’s L'enfance du Christ. This April, he will sing the baritone solos in Ernest Bloch’s Avodath Hakodesh at Missouri State University. Dr. Stinson holds a Bachelor of Music degree from Oberlin Conservatory, a Master of Music degree from Indiana University, and the Doctor of Musical Arts degree in Voice Performance from the University of Cincinnati, College-Conservatory of Music. He has previously taught on the faculties of Northern Kentucky University, Xavier University, College of Mount Saint Joseph, and Baldwin-Wallace Conservatory. He is currently an Assistant Professor of Voice at the Crane School of Music at SUNY Potsdam and a voice instructor at Crane Youth Music camp. Tickets are $22 adults, $18 seniors/military, and $5 for students, ages 6-17, and college students with I.D. For tickets, contact the CPS box office at 315-267-2277, visit onny.org, or purchase them at the door. ONNY is supported, in part, by the New York State Council on the Arts, a state agency, with the support of Governor Andrew Cuomo and the NYS Legislature, and the Northern New York Community Foundation. The James and Katherine Andrews 2017 Young Artist Instrumental Competition was held recently in SUNY Potsdam's Hosmer Hall. Pictured from left to right are: Kenneth Andrews, Music Director/Conductor of the Orchestra of Northern New York; John Lindsey, ONNY concertmaster and competition judge; Nicholas Cantello (French Horn), Syracuse, second place winner; Silas Smith (harp), Malone, third place winner; Hannah Sohn (cello), Colonie, first place winner; Eugenia Tsarov and John Ellis, competition judges. The competition requires students to play from memory a piece selected from an approved repertoire. Ms. Sohn will perform with the Orchestra at its upcoming concert, The Planets, at 7:30 pm, Saturday, March 18 and 3:00 pm, Sunday, March 19. For tickets or more information, visit www.onny.org or call 315-267-3251. POTSDAM - Students from nine area public schools will have their artwork on display in SUNY Potsdam's Snell Theater lobby for the Orchestra of Northern New York's concert, The Planets - Our World and Beyond! Concerts are 7:30 pm, Saturday, March 18 and 3:00 pm, Sunday, March 19th. The art show includes student works that have a celestial or planetary theme. It is being coordinated by Jason Hubbard, art teacher at Norwood-Norfolk Central School, and sponsored by the ONNY Volunteer Guild. During intermission of the Sunday performance, milk and cookies will be served in the Crane Commons, courtesy of PACES, for all children in attendance. The ONNY concert features Gustav Holst's The Planets, and includes a multi-media presentation that will be projected onto a large screen above the orchestra. Visual artist Adrian Wyard of Seattle will coordinate the computer software that features NASA photography, original animations, and imagery from telescopes, orbiting spacecraft and rovers on the planets' surfaces, all in sync with the conductor's direction of the work. Tickets are $22 for adults, $18 seniors and military personnel, and $5 students, ages 6-17, and college students with I.D. For tickets, call 315-267-2277, visit www.onny.org, or purchase them at the door.